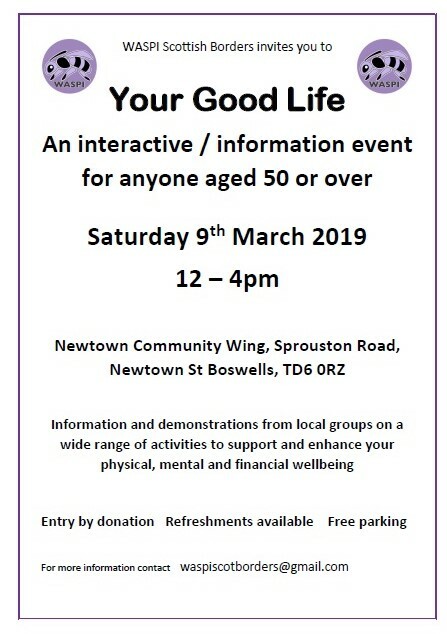 WASPI Scottish Borders would like to invite you to “Your Good Life” an interactive & information event for anyone aged 50 or over. 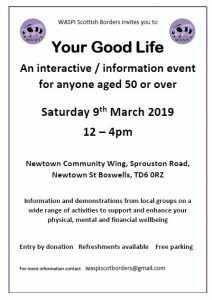 They will have information and demonstrations from local groups on a wide range of activities to support and enhance physical, mental and financial well being in older people. They aim to attract men and women aged 50 and over to this event. If you would like to join them on the day to find out more about activities available across the Borders, you would be most welcome. Your attendance would provide you with the opportunity to meet with local people in an informal environment.